starts. According to curator Jeremy Lewison, the initial idea was to put the work of Mark Rothko into the mix instead of Cy Twombly but upon further thought, Twombly became the obvious candidate. This is of course a good decision, especially with the knowledge that in Twombly’s large collection of rare letters, he owns unpublished letters from both Claude Monet and Joseph Turner; two people he greatly admired and influenced his work. Though the seven sections are clearly meant to separate the pieces, even by the curator’s own admission, pieces could switch section and it wouldn’t particularly make a difference. This only becomes obvious on the top floor with all three artists working well together though only vaguely within the theme assigned to each section whether it be Atmosphere or Fire and Water. This is however a more positive aspect than a negative as giving the works a rigid housing would only have worked against their loose and often free nature. Beauty, Power and Space opens the exhibit on the ground floor but could easily be its own separate show. The Turners on display here are classicist than his more famous pre-empting of Expressionism. Light and Colour (Goethe’s Theory) brings this idea to the fore, being a painting of Moses writing the book of Genesis. However the obvious Turner elements are there and what sounds like an average retelling of classicism is morphed into a beautiful vortex of images where even life itself is shown to be created. Monet’s presence is barely felt in this section though his three works here, La Mer à Fécamp, Les Roches de belle – Lle, La Côte and Les Pyramides de Port-Coton, effet de Soleil are all dramatic seascapes showcasing La Mer’s constant attack of the rocks of the French coast. Though not as interesting as his more colourful work, they show a daring nature in the artist who clearly went to great lengths and with little regard to personal safety to obtain such views. 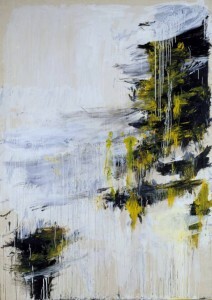 Twombly dominates the Beauty, Power and Space yet his works seem the least to bow to that Kantian ideal of sublimity. His untitled trilogy is the highpoint of his work on show in the entire exhibit and show a potential colourful set of waves depending on where the viewer finds their initial visual vantage point. Moving to the fourth floor sees the real themes of the exhibit begin to coerce. The obvious technical and stylistic connections are drawn but the idea of these being purely later works allows the thematic ideals to wash over the viewer. Twombly’s two Paesaggio’s take over their hanging space with an infinitely dark landscape being again bombarded by the sea but in an interesting aerial view rather than the typical landscape views of Turner. Monet’s Matinee sur la Seine is book ended by the two Paesaggios and seems even gentler than previously thought because of this. The sense of trying to capture the mist and the atmosphere in this section is realised most effectively in this painting and Monet’s work around this section of the gallery is at its most powerful (contrary to the many reviews that will continually wax lyrical over the water lilies). Turner’s work here also seems more and more complex with an increasing demand from the viewer to participate in order to gain even the simplest understanding of what the painting is actually of. The coastal scenes of his, in particular Sea and Sky, feel as though they are broaching the subject of age gracefully and are an extremely mild take on the constant battering of life. Turner’s sunsets also take centre stage on the fourth floor with works such as Sunset and Sun Setting Over a Lake determined to turn life into one day and allow the setting of the sun to reveal night as the ever-watchful reaper. It’s inevitable that some word space must go to Monet’s Water Lilies, though it seems crass that so many other reviews will concentrate on the exclusivity of the two paintings shown for the first time. Like other paintings of the Water Lilies the first thing that’s noticeable is their sheer size. Though size has been a gimmick of recent times to make an average painting seem far more exciting than it perhaps is, here it’s an obvious and starling achievement that Monet could transfer is gentle and relaxed to technique to such size without it losing any of its merits. The lilies themselves seem beautiful yet their static nature and sense of floating could easily be read as a reflection of many lives which are coasted through without going against the flow of tyranny or anything that makes life individual; a concern as ever present in today’s daytime television culture as it were then. There are over sixty works in the show so an individual breakdown of every single work is more in line with a short novel than an article. However some final space here will be dedicated to what this reviewer saw as the highlight of the exhibition. Monet’s Rouen Cathedral, Portal (Morning Effect) captures something more than overall the theme of the show. Its juxtaposition of making something manmade seen almost born of nature is something beautiful and endlessly moorish to look at. Yet it does capture that sense of the final approach to life. Perhaps it’s the building itself that bottles this feeling but the gentle blues and delicate brush strokes show a reasoning with the building and an acceptance of death better than any other painting in the exhibit. In his film F For Fake, Orson Welles could see this aspect too in Chartres Cathedral and so the final words go to him, who not only captures the essence of what Monet could see but also sums up the theme of Turner Monet Twombly: Later Works far better than perhaps anyone else ever will. Our works in stone, in paint, in print, are spared, some of them, for a few decades or a millennium or two, but everything must finally fall in war, or wear away into the ultimate and universal ash – the triumphs, the frauds, the treasures and the fakes. A fact of life: we’re going to die. “Be of good heart,” cry the dead artists out of the living past. “Our songs will all be silenced, but what of it? Go on singing. – Orson Welles. The Tatton Park Biennial 2012.